Previously we installed the meat and potatoes of the Full-Race turbo kit including the turbo itself, exhaust piping, FMIC, and a few other goodies (Which we covered in PART 1). With everything in the engine bay looking good we moved to the interior of the car to get the gauges and boost control working. A high flow fuel pump was installed in place of the factory piece. With higher fuel demands the OEM pump can sometimes overheat and fail, which can result in a damaged engine and a bad day. Once this was buttoned up we moved onto installing the AEM Failsafe gauge. This gauge has a dual readout and can show both the Air-fuel ratio and boost pressure simultaneously. It also has the added benefit of being programmable and can be utilized to program in a “failsafe” parameter. Meaning that if a higher than desired boost pressure, or AFR is read, it can cut boost and/or fuel to potentially save the engine. To facilitate the extra safety parameters we wired the gauge into a manifold reference and the necessary factory ECU input. We only use high quality electrical wiring connectors and solder everything else into place, using heat shrink and securing wires where we can. 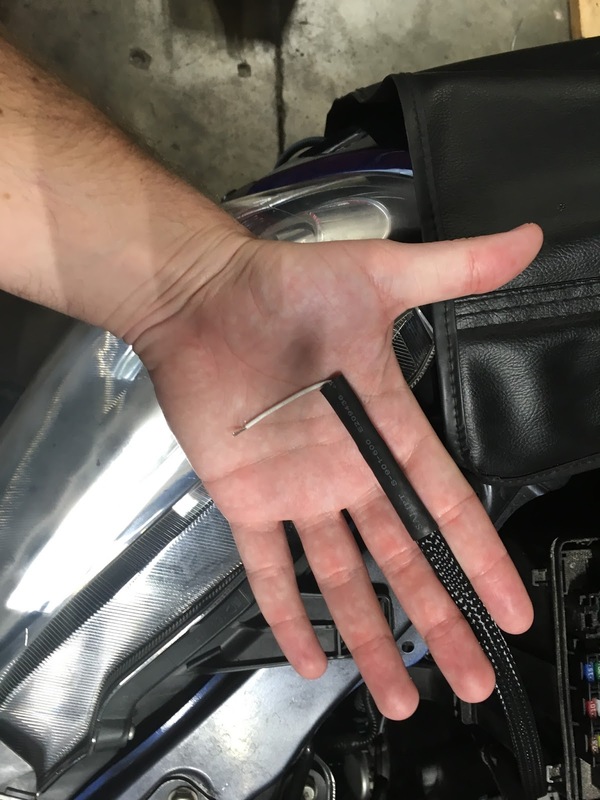 Dangling wires and loose connections are a surefire way to end a gauges life early, and we often see poor wiring jobs as a cause of gauge failure. 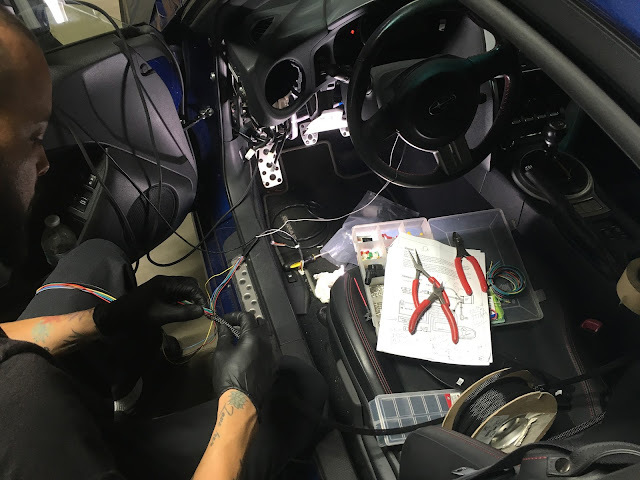 Once all of the wiring was done we mounted the gauge into a vent pod, which takes the place of the driver side AC vent, but still allows some air flow past so you don’t get too hot (which is an issue here in Florida). With the project looking good and most of the major parts installed we moved on to the finer details of this build. A build like this can be a "make or break" situation based on small details, and we think this is what sets us apart from other shops. We hooked the AEM gauge up to our laptop and setup the gauge to read boost pressure on the main screen and AFR on the outer ring. We then programmed the lights to read in a predetermined safe range, so a quick glance under boost will let you know if you are safe or not. After this we moved on to the engine bay to address some small issues we noticed on the intercooler piping. The piping on this car is very tight in the engine bay and was rubbing, or too close, to the core support. To remedy this without cutting huge holes everything, we installed professional grade weather stripping onto the support where the pipes could touch. This will provide a soft barrier and will prevent metal-on-metal contact, which would not only look and sound terrible, but would eventually rub through the soft aluminum pipes and create a leak. We also added a barrier sleeve to the AC high line, which was rubbing on the FMIC charge pipe. Again, this would eventually cause an issue and a leak, and this will prevent that from happening. One last finishing touch was to add rubber caps to the bolt ends of the T-bolt clamps used on the intercooler and intake piping. This not only provides some safety from rubbing or scratching other components (or fingers), but also adds a very nice finished touch visually. 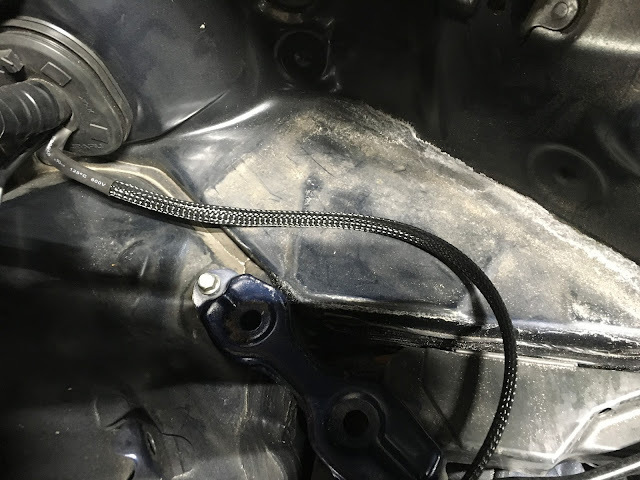 We then tuned our attention to mitigating heat issues, which included using a DEI insulated sleeve to cover the coolant lines running to-and-from the turbo so they don’t melt or super-heat the coolant. These same heat sleeves were also used to cover the oil drain line, and some critical electrical connectors in high-heat areas. One such item is the electrical connector for the radiator fans, which sits very close to the exhaust manifold and have been known to melt. DEI reflective gold tape was then used to cover the cool side intercooler tube that runs into the throttle body. It was also used on the AC compressor cover, the lower radiator hose, and the oil drain line. This tape reflects heat away, and can prevent damage and the super-heating of the fluids inside. The last item on this list was a PTP turbo blanket, which covers the hotside of the turbo housing and keeps the heat safely contained. The turbo itself produces the most heat out of any of the components isntalled, so this blanket is another imperative item to keep under-hood temps in check. All of these steps are the extra work than can make a difference between a car running great for a few hundred miles, or many thousands of miles! With our team satisfied with the install and finishing touches it was now time for our Ecutek Master tuner, Big Bob, to work his ECU magic. 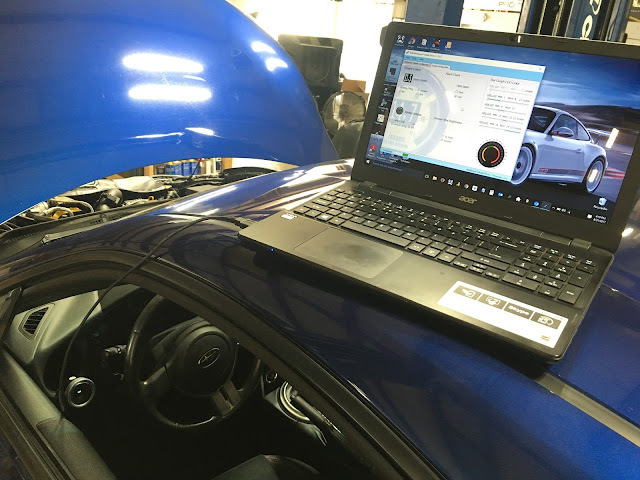 We utilize Ecutek tuning software as our preferred method to tune the factory ECU on our dyno, This professional grade software has many features and allows us to not only tune the ECU, but also build our own parameters into the tune including boost control and safety parameters. Bob takes the extra time to work in both boost and fuel cut safety features for our tunes, which creates several monitors that will come into play if there is an issue with fueling or boost. These extra parameters can potentially save an engine in the event a boost line pops off or a fuel system failure occurs. As the dyno rollers did their thing we knew we would be limited by fuel and would need to keep boost levels low. The factory fuel system on the BRZ is impressive as it uses both port and direct injection, however it still runs out of flow around the 280-300hp mark on most cars/setups. With this in mind we gently pushed the 7163 EFR turbo to about 6 pounds of boost, resulting in approximately 286hp to the wheels, that's over 125 horsepower gain to the wheels from stock! This put the stock injectors a little above 80% duty cycle, which is where we stopped to keep things safe. Off the dyno the car felt great on the street, the turbo spools up at a very low RPM and provides seamless boost pressure when you put your right foot down. The extra torque can be felt right away and propels the car off the line and out of corners in a manner that simply cannot be matched by an N/A BRZ. This is the EFR turbos biggest benefit, as it has great transient/boost response. The BRZ handled corners well but has fell flat on straights, but now with an EFR turbo on board it can do both very well! Overall we were very pleased with how this build came out and the owner was also very happy! He opted to retain the stock fuel system and exhaust due to budget constraints, but he is already talking about upgrading the injectors, exhaust, and adding a fuel return so we can turn the boost up and get more power out of this setup! The 7163 EFR turbo is barely being used at the current power levels, and could easily push over 500hp with the right mods. The owner knew this going in and wanted this setup so he could grow the car around the turbo kit as he wanted more power. The best part about this project is that we retain near stock drivability levels and with the hood closed, it appears to be just like any other BRZ on the road….until you hear the turbo spool and it takes off from a red light! Circuit Motorsports is a performance auto shop located in Orlando Florida. We specialize in performance upgrades, ECU tuning, and fabrication. If you are interested in a build consultation contact us today! What's a setup like that cost and install/setup/tune time frame? Depends on the options and turbo you choose. The Full-Race kit is around $6k, then we can add things like the oil cooler, clutch, fueling upgrades, etc. If you're interested in a setup like this feel free to call or message us and we would be happy to assist! Hey @Circuit Motorsports, I was curious, which line did you tap for the gauge and which line did you tap for the BOV in this setup?